Limited Edition Prints of Published Work. a high quality print from the original painting by Ed Touchette is signed by the artist. 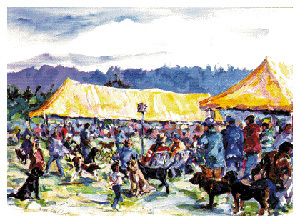 This painting was published on the inside front cover of the AKC Gazette, August, 1998. Ea. Print $20.00. Image size is approx. 20" x24". from the original painting by Ed Touchette, these 4 x 5 cards are printed on the highest quality coated paper. 15 per box with envelopes.$9.95 per pkg.